We are one of the world leaders in this technology, which enables faster construction, a reduction in reinforcement, thinner and more economical slabs, larger floor spans and fewer columns. Our in-house construction design capacity allows us to customise the slab for every job, and we investigate multiple paths to reducing slab thickness, steel usage and construction times. Optimising the design for both concrete and steel usage saves time and money and minimises environmental impact. Customers choose SRG Global because we are able to provide smart and efficient solutions to difficult problems, drawing on a depth of operational experience unparalleled in our industry. 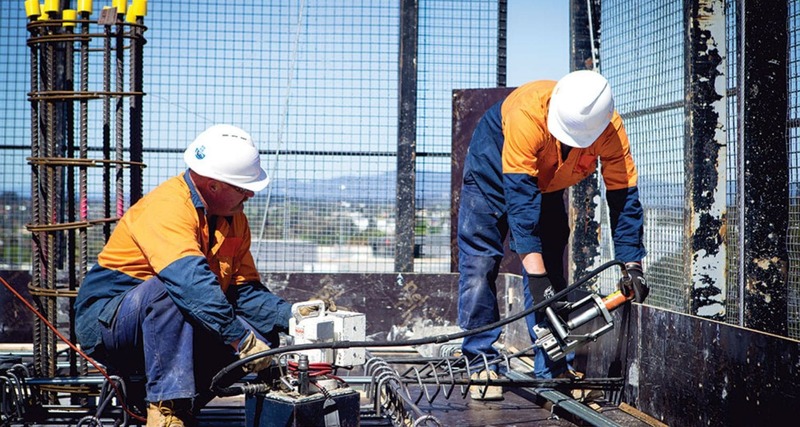 Our slab post-tensioning system offers all the stakeholders in a building project many benefits including reduced structure depth, greater clear spans, design flexibility, formwork versatility, reduced construction costs, enhanced construction speed, improved durability, minimum maintenance costs and reduced carbon footprint due to less concrete and steel required. Our bar post-tensioning systems are ideal for the economic application of post-tensioning forces on relatively short tendons. Through the use of threaded connections and anchorages they are simple to use and lend themselves to many applications. The robust coarse thread (CT) provided to the SRG stressbar ensures rapid and reliable assembly, particularly suitable for onsite use and reuse. Typical bar post-tensioning applications are buildings, bridges, wharves and jetties, soil and/or rock anchors and specialist engineering. All bars and fittings must receive protection when installed under permanent conditions. In normal concrete construction the use of galvanised duct injected with grout provides excellent protection. Anchorage recesses must also be filled with cement mortar to protect these ends. When bars are used in an exposed environment then other coating systems are available for the bar and fittings. Anchors used in a temporary environment may be used without protection apart from grout required to the bond length. These anchors require installation into corrugated polyethylene sheathing similar to strand anchors to provide multiple levels of protection. Additional protection may also be used by incorporating the above bar coating systems.